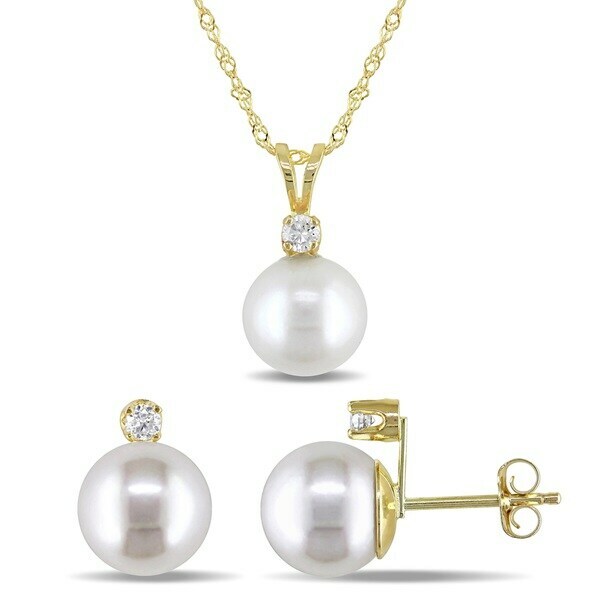 This Miadora pearl necklace and earrings set is crafted in 14-karat yellow gold and features three cultured freshwater pearls paired with three glistening diamonds in a classic solitaire design. This set is a perfect versatile addition to any collection. All weights and measurements are approximate and may vary slightly from the listed information. *T.W. (total weight) is approximate. 1/6 carat T.W. may be 0.13 to 0.18 carat. Treatment code N (white pearl, diamond). See Treatment Guide for further information.